Luca and I, together with some friends visited Japan during the summer of 2008. A mandatory stop was Hiroshima. There we visited the Hiroshima Peace Site, museum and park. 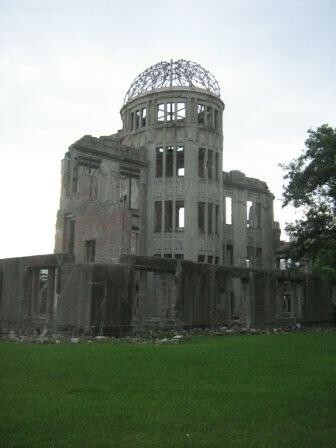 You can spend several hours in the museum: from reading about the life in Hiroshima prior to the war, during the war and before the bombing, about the Manhattan Project, learning from specific cases of victims of the bomb, several testimonies, replicas from wounded people, etc. Some parts of the museum are truly shocking. 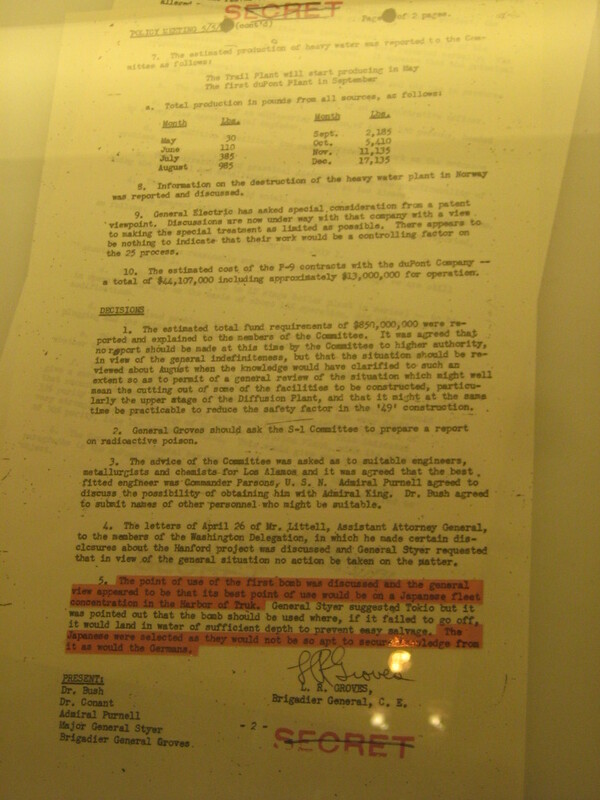 Letter from brigadier general Leslie Groves (Hiroshima Peace Memorial Museum). Einstein’s letter to F.D. Roosevelt (Hiroshima Peace Memorial). Some years ago, I read the book “The World as I see it“, from Albert Einstein in which he explained retrospectively his thoughts at the time of supporting the Manhattan Project. I already wrote a post about that book and recommend the reading of it. In the Memorial Park, two things caught my attention: Genbaku Dome and the story of Sadako Sasaki. The dome (also called “A-dome”) was the only structure in the area which was left standing. This is because the explosion of the bomb happened at about 600m above the dome and about 150m away horizontally enabling the structure to stand the nearly vertical compression it suffered due to the blast. The dome was initially scheduled to be demolished, but finally it was preserved, being today UNESCO World Heritage Site. Legend says that anyone who folds one thousand paper cranes will have their heart’s desire come true. The origami crane has become a symbol of peace because of this legend, and because of a young Japanese girl namedSadako Sasaki. Sadako was exposed to the radiation of the atomic bombing of Hiroshima as an infant, and it took its inevitable toll on her health. She was then a hibakusha — an atom bomb survivor. By the time she was twelve in 1955, she was dying of leukemia. Hearing the legend, she decided to fold one thousand origami cranes so that she could live. However, when she saw that the other children in her ward were dying, she realized that she would not survive and wished instead for world peace and an end to suffering. A popular version of the tale is that Sadako folded 644 cranes before she died; her classmates then continued folding cranes in honor of their friend. She was buried with a wreath of 1,000 cranes to honor her dream. 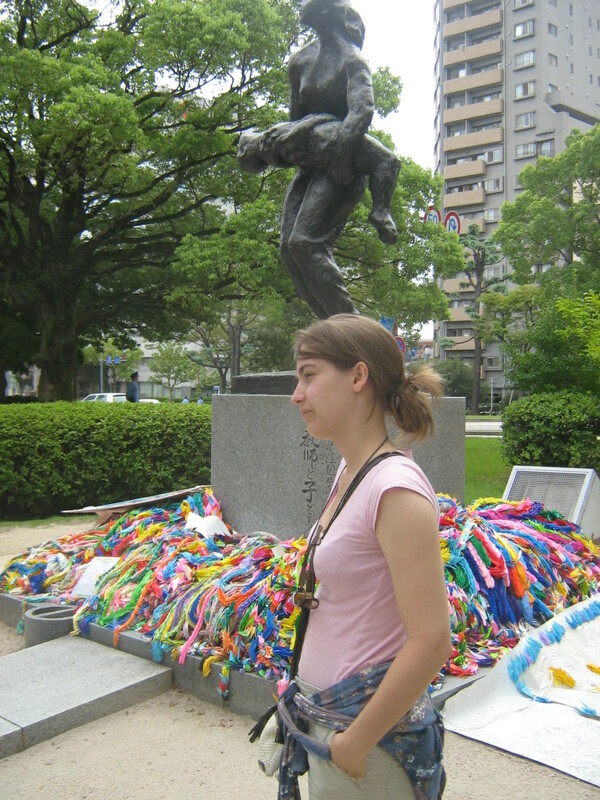 While her effort could not extend her life, it moved her friends to make a granite statue of Sadako in the Hiroshima Peace Park: a young girl standing with her hand outstretched, a paper crane flying from her fingertips. Every year the statue is adorned with thousands of wreaths of a thousand origami cranes. I shall write peace upon your wings, and you shall fly around the world so that children will no longer have to die this way. Hiroshima Peace Memorial park paper cranes. Boeing B-29 Superfortress “Enola Gay” at National Air and Space Museum (Washington DC). 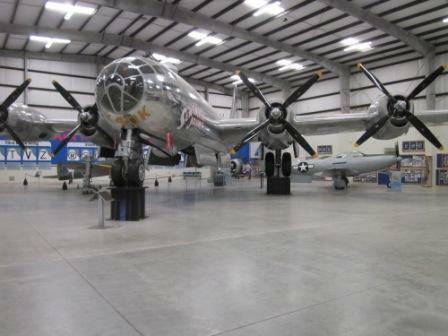 Boeing B-29 Superfortress at Pima Air and Space Museum (Tucson, AZ). 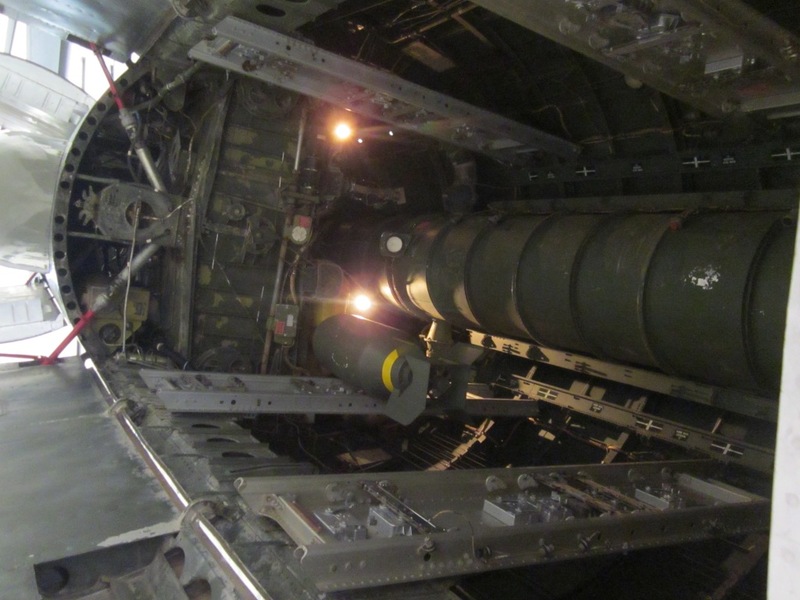 Bomb bay of a B-29 Superfortress (at Pima Air and Space Museum, Tucson, AZ). 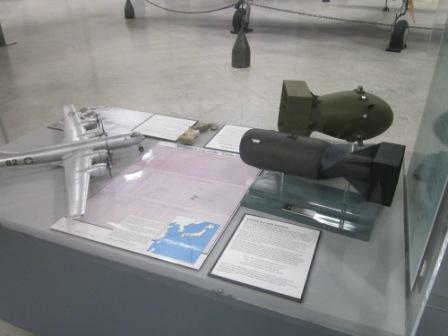 B-29 “Enola Gay” replica and “Little Boy” bomb replica (at Pima Air and Space Museum, Tucson, AZ). And finally, you could see a replica of the Enola Gay’s Navigator’s Log. I was caught by surprise to find all this material at the museum. The original log, written by the navigator that day, Theodore “Dutch” Van Kirk, was sold in a public auction some years ago for over 350k$. While at the museum, I took some minutes to watch the replica, the route the plane followed, the points of reference it used, the notes he made… and especially, the line in which Theodore, at 9:15am, noted “Bomb Away” (the 10th line of the second box) just before turning back over the port of the island of Omishima (which is wrongly reported in the log as “Mishima”). 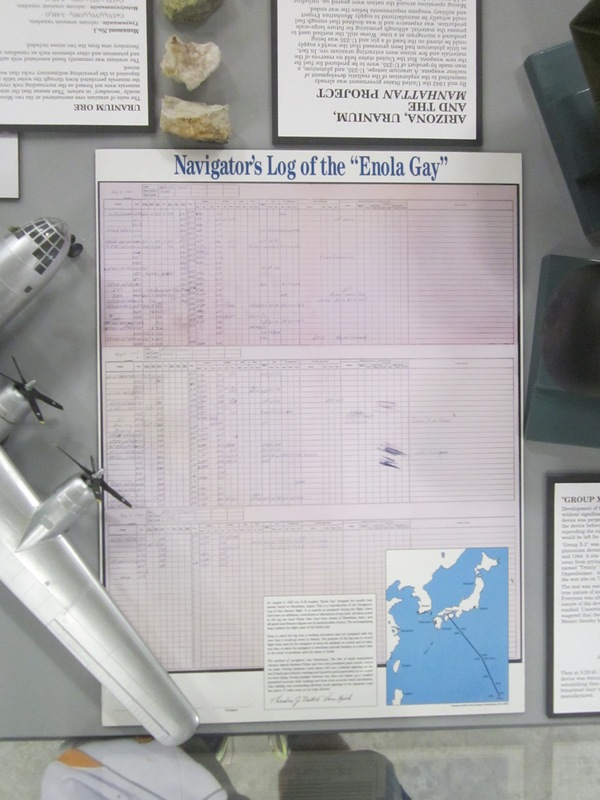 Replica of Navigator’s Log of the “Enola Gay” (at Pima Air and Space Museum). 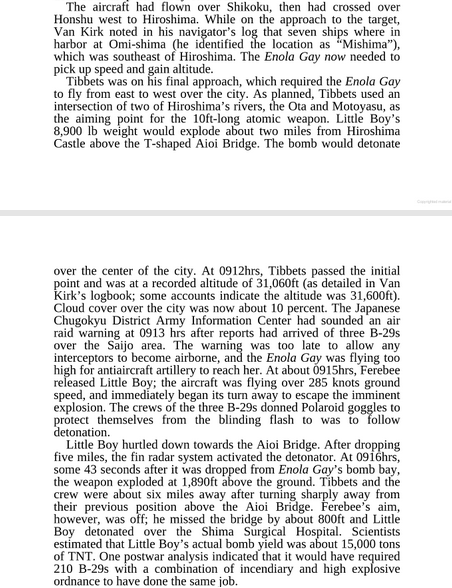 Excerpt from “Japan 1945: From Operation Downfall to Hiroshima and Nagasaki” by Clayton Chun. It was a long post this time, but I think it was worthwhile to touch the story from the several points of view I have “experienced” it throughout these last years. 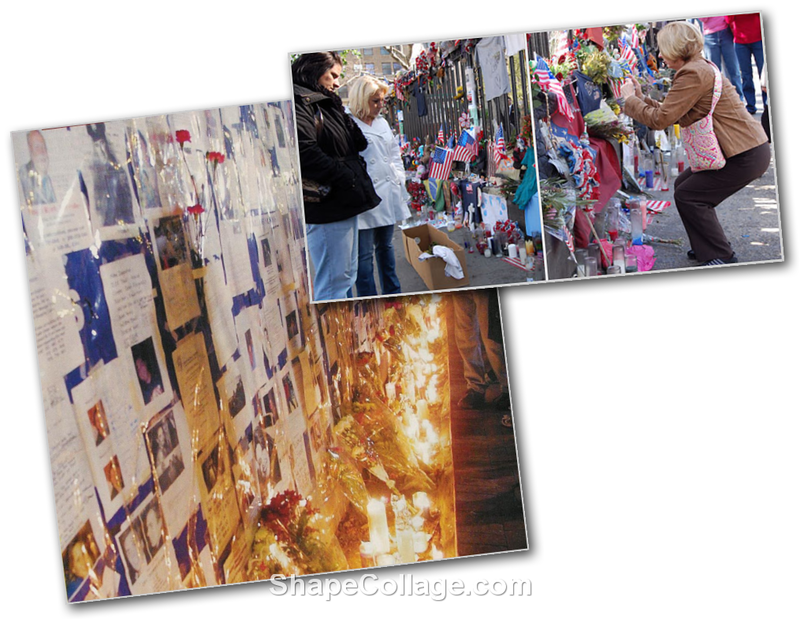 That fence in the picture is at Saint Paul’s Chapel, just across from where the World Trade Center once stood. That chapel was as well the place where many of the people working in the site in those days found relief. 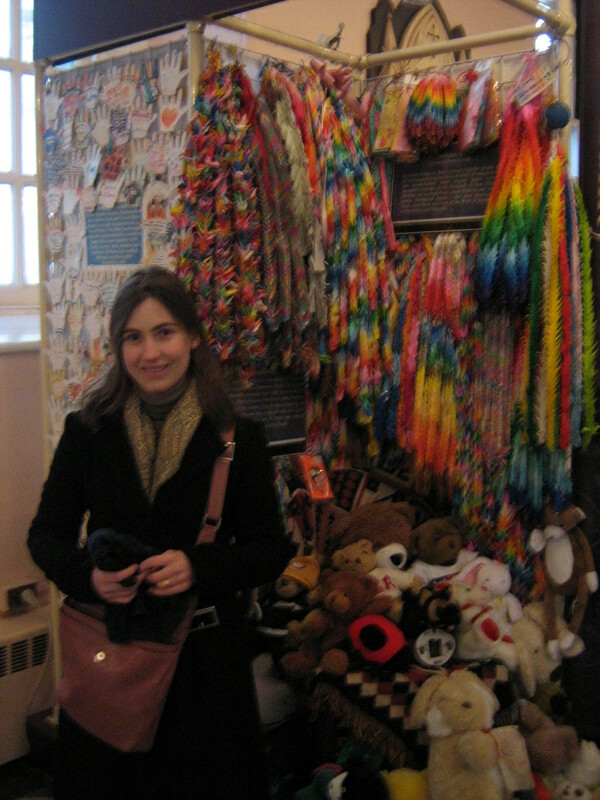 Paper birds in Saint Paul's Chapel. I didn’t know I would find this, so it immediately rang a bell, as it was something I had learnt not so long before. Japanese call to the tradition of folding papers origami. There, the most famous design is that of the Japanese crane, a long-necked bird. The first time I saw such paper birds was in the Hiroshima Peace Memorial park, in the summer of 2008. Legend says that anyone who folds one thousand paper cranes will have their heart’s desire come true. The origami crane has become a symbol of peace because of this legend, and because of a young Japanese girl named Sadako Sasaki. Sadako was exposed to the radiation of the atomic bombing of Hiroshima as an infant, and it took its inevitable toll on her health. She was then a hibakusha — an atom bomb survivor. By the time she was twelve in 1955, she was dying of leukemia. Hearing the legend, she decided to fold one thousand origami cranes so that she could live. However, when she saw that the other children in her ward were dying, she realized that she would not survive and wished instead for world peace and an end to suffering. This is how the cranes flew from Hiroshima to New York; unfortunately peace hasn’t reached that far.